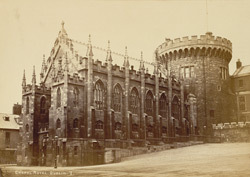 "The Castle of Dublin is divided by a range of buildings into two courts or yards, the upper and the lower, into the former of which the principal entrance from Castle-street leads. The Lower Yard contains the Birmingham or Record Tower, the only remaining portion of the ancient fortress founded in 1205, and completed in 1220, by Henry de Londres, the notorious archbishop, whose name has been handed down to posterity with the unenviable sobriquet of 'Scorchbill,' from his having treacherously burned the writs and papers by which his tenantry held their houses and farms. This beautiful edifice is seventy-three feet long, and thirty-five broad. The exterior is ornamented with no less than ninety heads, including all the sovereigns of England...The chapel was opened for worship in the year 1814."